Gino Torretta capped an illustrious collegiate career by bringing the prestigious Heisman Trophy award back to the Coral Gables campus in 1992. Entering the 2002 season, Gino was still ranked as Miami's all-time leader with 7,690 passing yards, 555 completions and 7,722 yards in total offense. He also had 123 consecutive pass attempts without an interception. 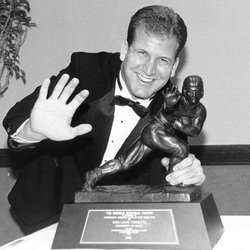 The 1992 season was to be Gino Torretta's coronation as the Heisman favorite. But the season started amidst disaster as Hurricane Andrew ripped through South Florida just 12 days before the season opener at Iowa. Dealing with the emotional aftermath, Gino led the Hurricanes to a 24-7 win over the Hawkeyes on national television by passing for 433 yards and two touchdowns. If there was a game that typified his career it was the win against Florida State. Miami trailed 16-10 with 9:05 left in the fourth period when Gino led the Hurricanes on a 58-yard scoring drive to take the lead. In his final year, Gino dominated the Heisman voting, outdistancing San Diego State's Marshall Faulk and Georgia's Garrison Hearst. The Heisman capped an unparalleled season as Gino became the most decorated football player in Miami history. Torretta took every award available to him in '92: the Maxwell Award (best overall player), Davey O'Brien Award (top quarterback), Unitas Award (top senior quarterback), consensus All-American, and every Player of the Year Award.